Sliced onions, sundried tomatoes, and minced garlic sauteed in a small amount of butter. 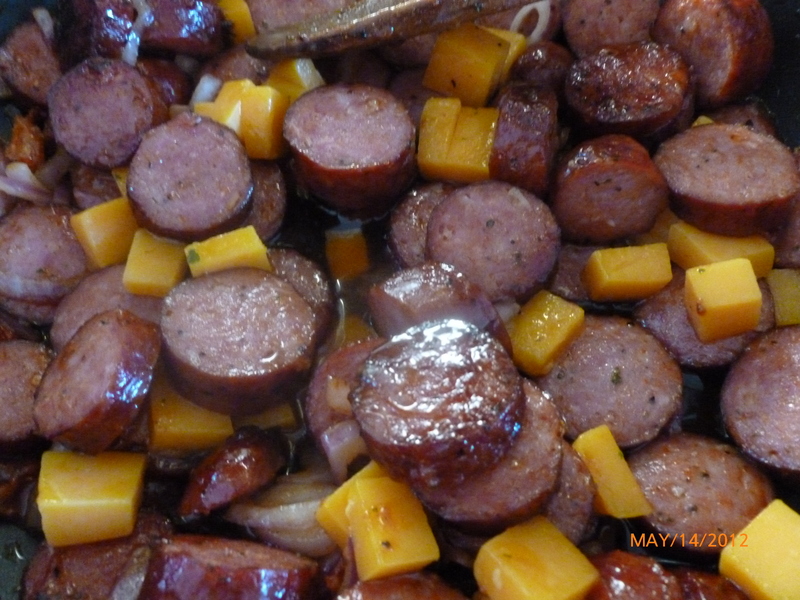 Add sliced double smoked cooked sausage pieces that are soaked in mesquite marinade. Heat then add squares of extra sharp cheddar cheese. Combine 2 lbs of frozen stew meat, two 14oz cans of beef broth, 1 package of brown gravy mix, 1 package of onion soup mix, 1 package of au jus gravy, 1 cup of water, and 4 dashes of pepper into a large crockpot. Heat meat for 2 hours at 375 degrees. Add 2-3 cups cubed potatoes and sliced carrots. Turn heat down to 250 degrees and cook for another hour or until potatoes and carrots are tender. 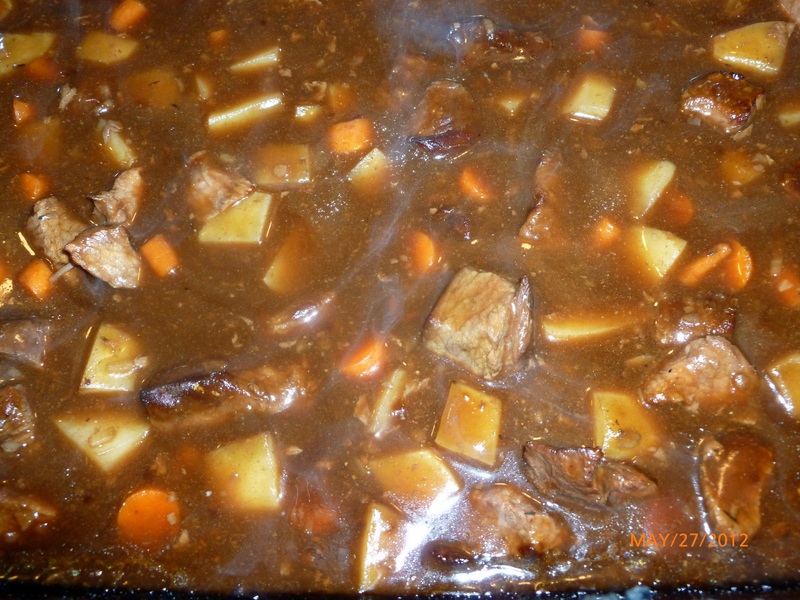 My husband never liked his mom’s stew- but he devours mine! Chicken grilled on butter and garlic and basted with pesto sauce after all meat is white, then placed on cooked garlic Texas toast. 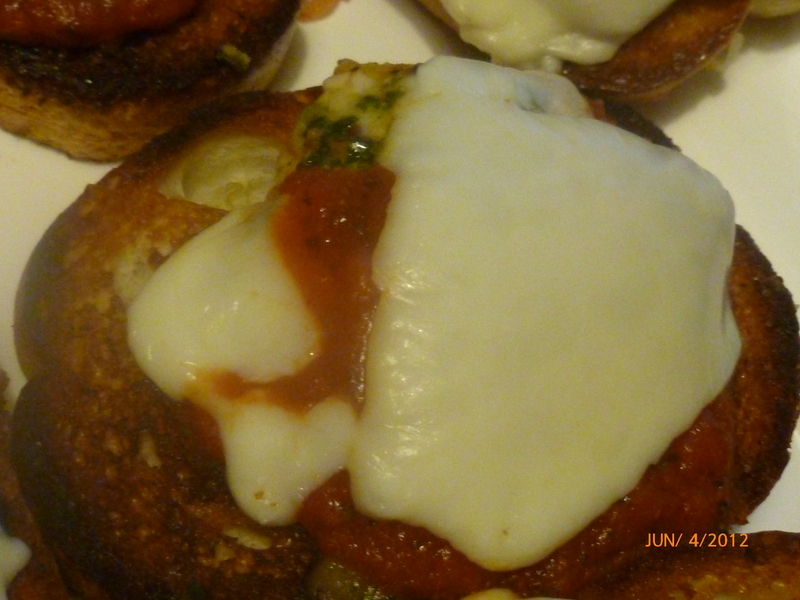 Pour 2 large spoonfuls of favorite spaghetti sauce over chicken and toast then top with mozzarella cheese. Heat in oven until cheese is melted. Buon appetito! 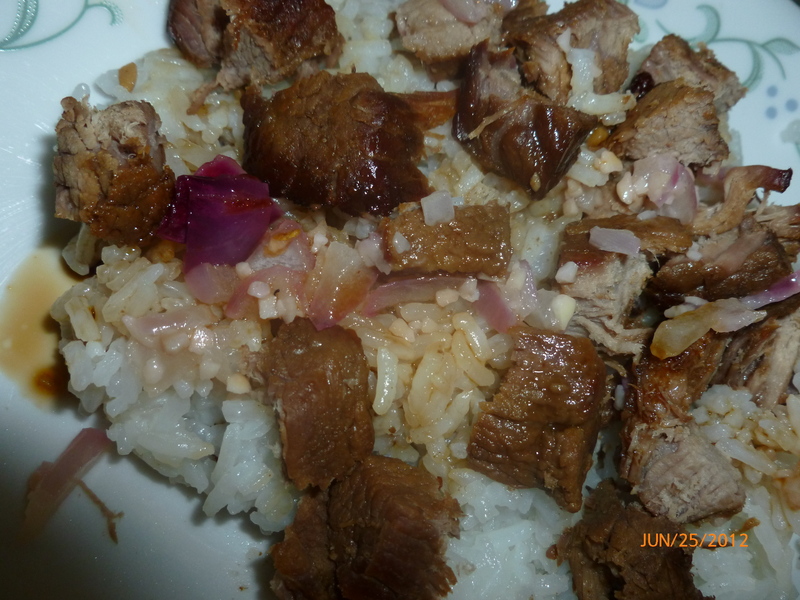 Stew meat cooked in slow cooker with garlic, teriyaki sauce, and chicken broth until done, white Jasmine rice, and top all off with some red onions sauteed in butter and garlic. Pour just a tad bit more teriyaki sauce over everything for more flavor. I served with some egg rolls and tea to “authenticate” the dinner experience. 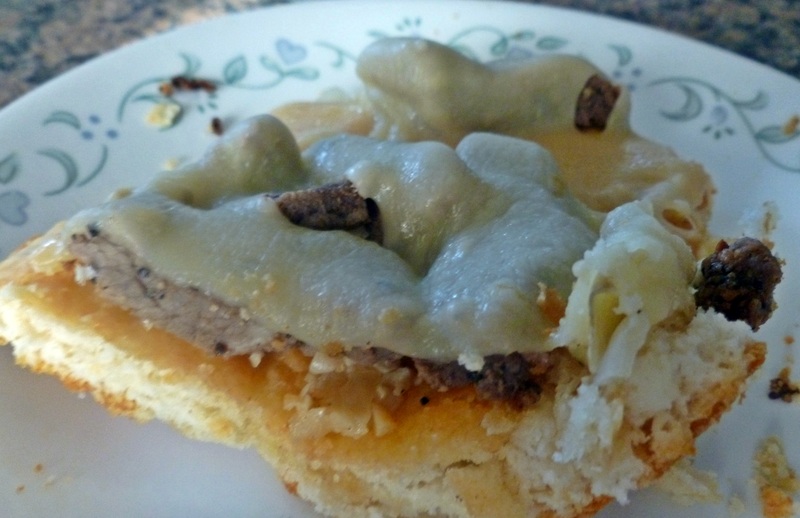 Biscuit mix baked in a cake pan topped with onions sauteed in garlic and butter, then some marinated sirloin steak, then slices of swiss cheese. 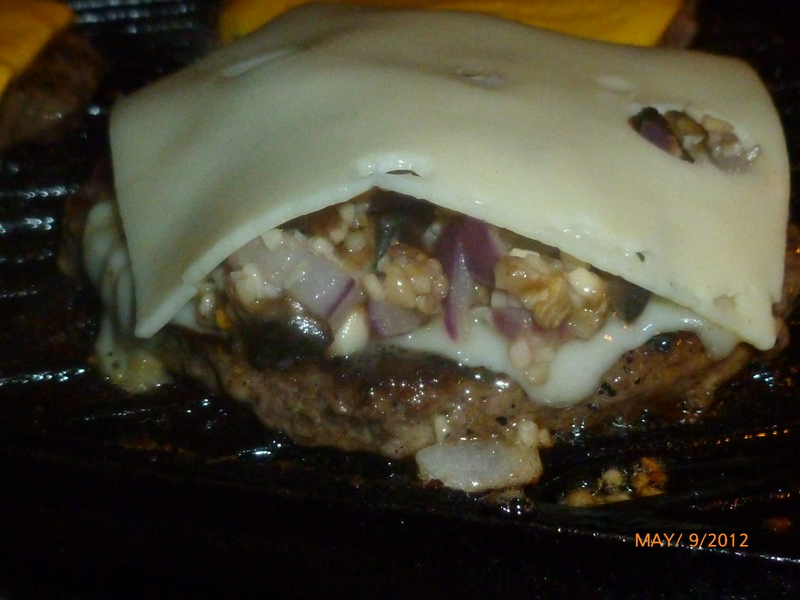 Place in oven again until cheese melts over and serve warm! With fingers or fork- enjoy! My kids think I’m weird taking pictures of food also! But darn, it looks good!